Conceived as the first virtual hip-hop group, Gorillaz blended the musical talents of Dan "The Automator" Nakamura, Blur's Damon Albarn, Cibo Matto's Miho Hatori, and the Tom Tom Club's Tina Weymouth and Chris Frantz with the arresting visuals of Jamie Hewlett, best known as the creator of the cult comic Tank Girl. Gorillaz debuted in late 2000 with the Tomorrow Comes Today EP, which they followed early the next year with the Clint Eastwood single; their self-titled full-length debut arrived in spring 2001. A side project doesn’t usually hit gold, especially when said project is a quirky virtual collective fronted by cartoon characters. But the first album by Gorillaz actually hit platinum and turned into a surprise worldwide hit. Naturally expectations were a lot higher for Gorillaz's sophomore effort, but Demon Days actually is even better than its predecessor. In the past Gorillaz have delivered awesome tracks ranging from punk rock to slow, mellow tunes. The new album is no exception to this perfect mix. With producer Dan "the Automator" Nakamura gone, Albarn, a.k.a. 2D, has paired up with DJ Danger Mouse (responsible for the infamous Grey Album that illegally mixed The Beatles and Jay-Z) to steer the musical ship, while a whole new slew of guests enlivens the proceedings. 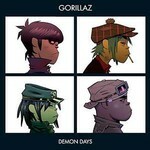 Albarn has described Demon Days as being darker, but there's a real kooky dance-party vibe coursing through the CD. Despite its somber tone, Kids With Guns is lifted by a killer bass line, for instance, while the catchy first single, Feel Good Inc, is augmented by an appealing contribution from De La Soul. Other noteworthy guests include Roots Manuva and Tricky collaborator Martina Topley-Bird on the dubby All Alone and Happy Mondays singer Shaun Ryder on the bouncy Dare. And yet it's a 69-year-old actor who gets to deliver the most baffling contribution – just listen to Dennis Hopper's spoken-word narrative on Fire Coming Out of the Monkey's Head. Demon Days may end 2005 as one of the year’s most celebrated albums. Before you even consider the sonic and melodic innovation paraded through the album there’s so much crammed into each of these fifteen songs (without any one of them sounding overproduced or cluttered) that repeated listening is a must. With Demon Days, repeated listening is like throwing a dolphin a fire escape – entertaining the first time, impossible to predict the outcome on each subsequent attempt. There’s always something new to enjoy. Instrumental in this album’s charm is Danger Mouse’s production, which propels the album far beyond the limits of its predecessor; the standard Gorillaz sonic motifs (light-headed dub, left-of-centre electronic flourishes, caricatured wailing from another planet and the irresistible thud of a thousand bass bins) remain, but there’s a seemingly unselfconscious desire from all parties to innovate within the realms of the modern pop song. They succeed at every turn, and the inevitable rolecall of guest stars keep it moving. Even the score from Dawn Of The Dead pops in to say a spooky hello at the album’s outset. Dare is the finest moment on an album which never drops below total brilliance: it will be absolutely everywhere this summer.